Joseph Federico Names NJ MET’s 2015 Holiday Toy Drive Recipient: Oasis, a Haven for Women and Children, Paterson, NJ. The toys were delivered on Tuesday, December 22, in time for Christmas. NJ MET Vice President Joseph Federico announced that the company’s annual holiday toy drive will benefit Oasis, a Haven for Women and Children, in Paterson, NJ for the fourth consecutive year. Toys and games have been collected since Thanksgiving and were delivered on December 22, 2015 by Michael Giannini and Hari Patel. 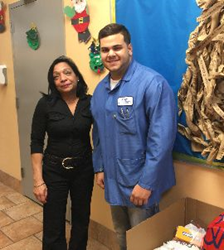 Since 2001, Wayne, NJ resident Joseph Federico has led this drive at NJ MET Inc. which has collected many toys for distribution throughout the New Jersey area. “Customers, friends and family continue to participant in this worthy cause by supporting our drive,” said Joseph Federico from NJ MET’s headquarters in NJ. According to their website, Oasis is dedicated to feeding and clothing needy women and children and to offering them educational resources and skills to obtain meaningful employment and to break the cycle of poverty. Oasis offers these services in a safe, compassionate and nurturing environment. Oasis is committed to fostering healthy family relationships, and seeks to preserve the dignity of people and their cultures. Previous NJ MET Holiday Toy Drive recipients have included the American Red Cross relief efforts in the US, Japan and Haiti, The Dana Farber Cancer Institute (Jimmy Fund) of Massachusetts as well as Eva’s Village and the Pediatric Department at St. Joseph’s Medical Center in Paterson. For more information about NJ MET’s charitable giving programs, please visit http://josephfedericonj.biz/njmet-charity.htm or view Mr. Federico’s corporate charity ideas blog.